Corporate desktop infrastructures continue to challenge IT. End-user and enterprise business requirements often clash with the IT department’s charter to deploy and manage desktops while lowering costs and managing associated risks. And with such growing trends as “free seating,” “home working” and “digital allowance” rapidly gaining traction, the struggle is growing exponentially. 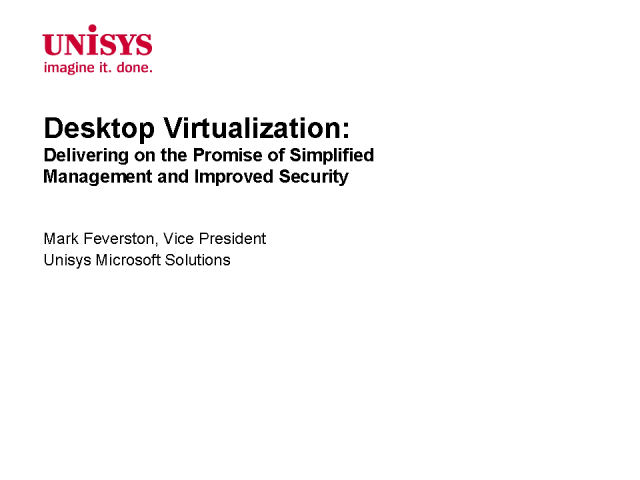 Virtualization offers a powerful, cost-effective alternative to traditional desktop PCs. New products also can reduce the burdens of managing and securing Windows desktop environments. However technology alone does not solve the issue. A structured services approach to architecting and implementing desktop virtualization technologies is critical to success.